No birds this time, just one of my favourite rings. I made this a few years ago and haven’t been able to part with it yet. 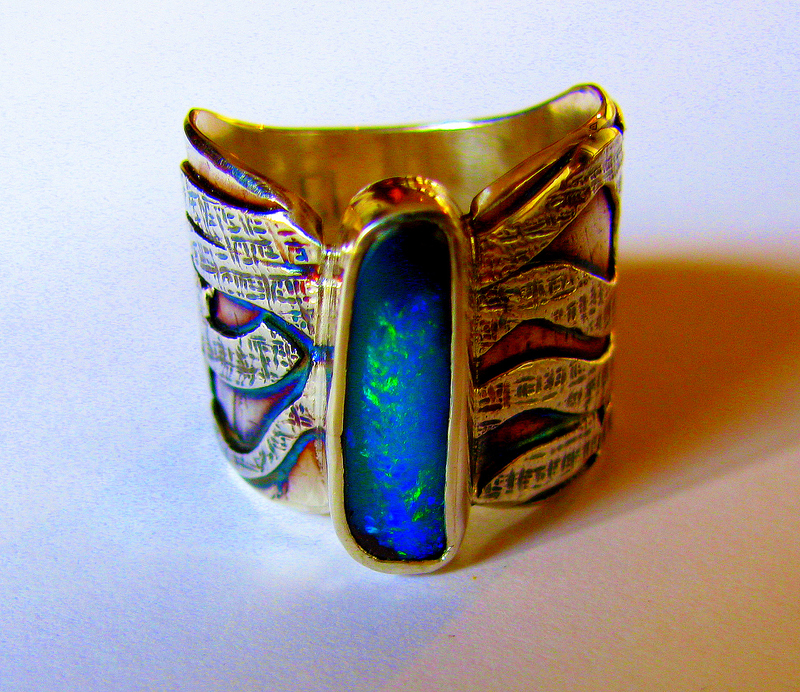 The design was inspired by the earth’s strata where this opal was formed millions of years ago. Leave a comment, I’d like to hear what you think. This entry was posted in Boulder opal ring and tagged apricot miniture poodle, Australia, Bead and Gemstone, bezel, bird, blue wren, blue wren bird brooch silver gold jewellery jewelry, boulder opal, brooch, cloisonne enamel, cockatoo, commission, coot, custom made, doublet, Earring, fine silver, Gemstone, gold, gold jewelry, gold silver, hand crafted, hand made, jewellery, Jewelry, kookaburra, lorikeet, magpie, one of a kind unique, Opal, partridge, poodle, quail, repousse, ring, Robin Phillips, setting, Shopping, shrink plastic, Silver, silver jewelry, Solder, sterling silver, Wire. Bookmark the permalink. Can i please have it? This boulder ring is breathtaking. Could you tell me please how much is it? Im in love with it. Love your work. Just looked at all the photos. What a process to create each piece. Also love the puppy photo! cloisonné flower earrings … gorgeous! !